Facebook/North Port Police DepartmentDaniel Nicastro, center, with officers from the North Port Police Department. For most people, the police crashing a party is a total buzz-kill. For 8-year-old Daniel Nicastro, it was a dream come true. Daniel, who is autistic, had invited several friends to his eighth birthday party, but not one called to RSVP. His parents already knew this feeling well. That’s when they got the idea to invite their local police department in North Port, Florida. Daniel has always admired police officers and viewed them as superheros, his parents said. So they brought invitations to the police station, unsure of how the officers would respond. They didn’t tell Daniel a thing. 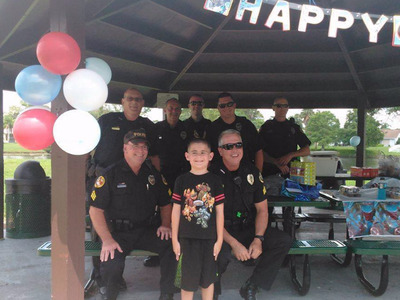 The North Port police delivered in a big way: A whole group of officers surprised Daniel at the party, bringing gifts and posing for a picture that’s been shared over a thousand times on Facebook. The response to the story has been so overwhelming that the police department has decided to host a larger celebration for children in town.